4 Cylinder manufactured from top grade Duplex 2304 stainless steel. Especially selected for it's high resistance to stress and crevice corrosion. 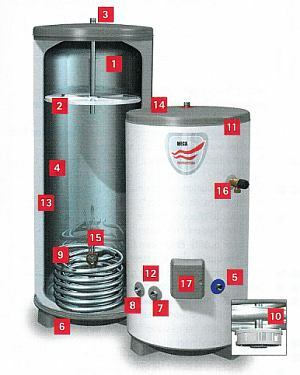 WHICH Megaflo cylinder should you use? Note: When purchasing 'additional' immersion heater, only the top heater should be necessary as the lower 'l' shaped immersion heater is always provided. Only one 'L' shaped immersion heater should be fitted. DDD cylinders are supplied with three elements and a blanking plug which can be fitted as required to 4 bosses, one at the boost position and three near the base of the unit. This gives a choice of heating options dependent on application. CL210, CL250 and CL300 have boost upper element boss blanked off.